On Aug. 20, amateur astronomer Masayuki Tachikawa of Kumamoto city, Japan, spotted a fireball on Jupiter, and caught the apparent impact on video. 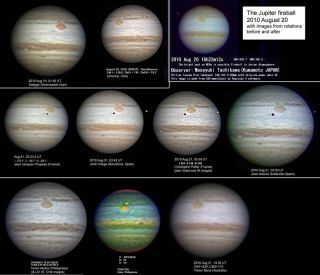 In this compilation of high-resolution images created by John Rogers, director of the British Astronomical Association's Jupiter section, the planet is seen 1-2 rotations before and 1-2 rotations after the Aug. 20 fireball. This storywas updated at 11 p.m. ET. Twofireballs from collisions with Jupiter in June and August provided a great showfor the skywatchers who spotted them, packing a punch and suggesting the gasgiant could be in for ?frequent ?punishment. In bothinstances, amateur astronomers using backyard telescopes were the first todetect two small objects that burnedup in Jupiter's atmosphere. Since then, the skywatchers teamed up withprofessional astronomers to study the fireballs, which were likely caused byrogue asteroids or comets. The objectthat caused the June3 fireball was determined to be 30 to 40 feet wide (8 to 13 meters). Infact, it was comparable in size to 2010 RF12, the second of two asteroids thatflew by Earth Wednesday, and it slightly larger than the asteroid 2008 TC3,which burned up above Sudan two years ago. The energyreleased by the object as it plunged into Jupiter's atmosphere was estimated at1 quadrillion to 4 quadrillion joules (300 million to 1 billion watt-hours). Analysis iscontinuing on the Aug.20 fireball, but scientists said the size of that object was comparable tothe June 3 invader. Though each fireballpacked a wallop, the energy of the June 3 crash was still five to 10 times lessthan from the meteor or comet that entered Earth's atmosphere in 1908 and burstover a remote part of Russia, an explosion known as the Tunguska event that knockedover tens of millions of trees. The June 3fireball was spotted by skywatchers Anthony Wesley in Australia and ChristopherGo in Cebu, Philippines. The amateur astronomers worked with a team of pros ledby researcher Ricardo Hueso, of the Universidad del Pa?s Vasco, in Bilbao,Spain, to determine the size of the fireball. Skywatcherslike Wesley and Go who are able to detect such small-size impacts can help makesignificant contributions to wider astronomical studies, Hueso said. "Thediscovery of optical flashes produced by objects of this size helps scientistsunderstand how many of these objects are out there and the role they played inthe formation of our solar system," he explained. Three daysafter Wesley and Go detected the fireball, Hueso and his colleagues looked forsigns of the impact in high-resolution images from larger telescopes, includingNASA's Hubble Space Telescope, Gemini Observatory telescopes in Hawaii andChile, the Keck telescope in Hawaii, the NASA Infrared Telescope Facility inHawaii, and the European Southern Observatory's Very Large Telescope in Chile. The scientistsanalyzed the images for thermal disruptions and chemical signatures, andcompared them with those seen in previous images of Jupiter impacts. They sawno signs of debris from the June 3 event, which allowed them to limit theirestimate of the size of the impactor. Based on theimages, the astronomers were able to agree that the flash probably came from asmall comet or asteroid that burned up in Jupiter's atmosphere. They estimatedthe impactor had a mass of about 1 million to 4 million pounds (500 to 2,000metric tons) ? or about 100,000 times less massive than the object from a July19, 2009, collision that created a bruise on Jupiter the size of the PacificOcean. Scientists now think that spectacular crash involved an asteroid about1,600 feet (500 meters) wide.? The Aug. 20 fireballwas first observed by Japanese amateur astronomer Masayaki Tachikawa and laterconfirmed by Aoki Kazuo and Masayuki Ishimaru. That fireballflashed for about 1.5 seconds. The Keck telescope, which observed the impactsite less than a day later, found no debris remnants. Otherassaults on Jupiter have included the 1994 incident in which the cometShoemaker-Levy 9 broke into more than 20 pieces and pelted the gas giant repeatedly.At the time, astronomers estimated such impacts could occur on Jupiter every 50to 250 years. With therecent collisions occurring less than a year after the July 2009 incident,researchers are rethinking the estimates of the frequency of such impacts. "It isinteresting to note that whereas Earth gets smacked by a 10-meter-sized object aboutevery 10 years on average, it looks as though Jupiter gets hit with thesame-sized object a few times each month," said Don Yeomans, manager ofthe Near-Earth Object Program Office at JPL, who was not involved in the paper. "The Jupiter impact rate is still being refined, and studies like this onehelp to do just that."